An exciting Selling Exhibition of New Work by Resident Artists, Glennis Andrews and Fiona Norton together with invited Artists from around the North West working in a variety of media -Fused Glass, Metal Designs, Stone Carving, and FRAMED Collage, Paintings and Print Design. A chance to share Poems, Stories, and Song with others. Try out new work on a supportive audience…. Everyone welcome - Performers and Audience alike. Refreshments available. Fundraising for Manchester Homeless Agencies. Anyone welcome to try out new material to a small friendly audience, The last two Open-Mic nights have been really enjoyable - and each evening different from each other, because it was a different audience, and many new acts. The Event is held in the Shed at the back of our Gallery. Its a lovely creative space, and Claire Mooney who hosts the evening has often performed in this space. Access is through the back gate into the sculpture garden. Up to 40 people can be accommodated. We hope to make this a regular FIRST MONDAY IN THE MONTH if demand continues. 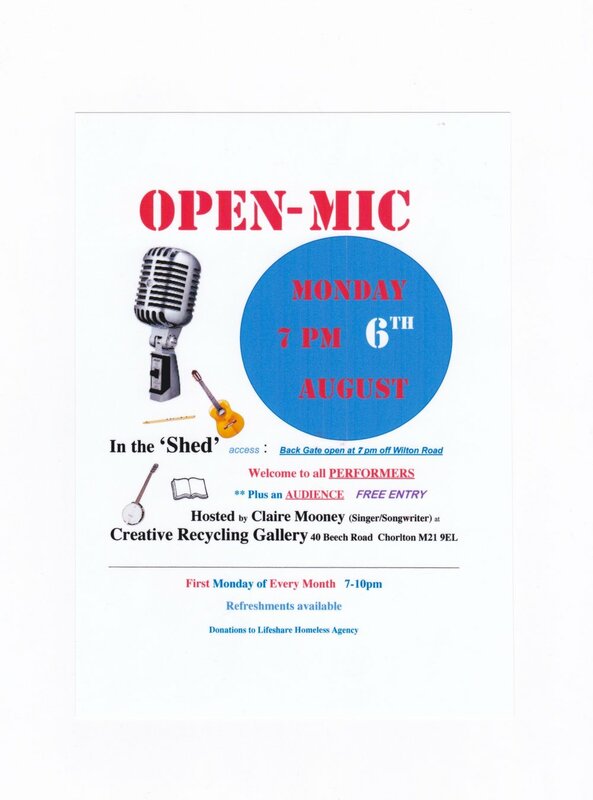 Come along to the 'Shed Studio' at Creative Recycling Gallery, for an evening of good music and fun...... a CHORLTON ARTS FESTIVAL SPECIAL - DRINKS AND NIBBLES. £5 PER TICKET seating limited - phone 0161 881 4422 to reserve a seat, and pay on the night. Our Coffee 'morning' will be an AFTERNOON event ! with Fair Trade Coffee and Tea and LUSCIOUS HAND MADE CAKES .......... a real treat, and a great cause - we hope to see as many people as possible to help raise funds for this nationally recognised event. 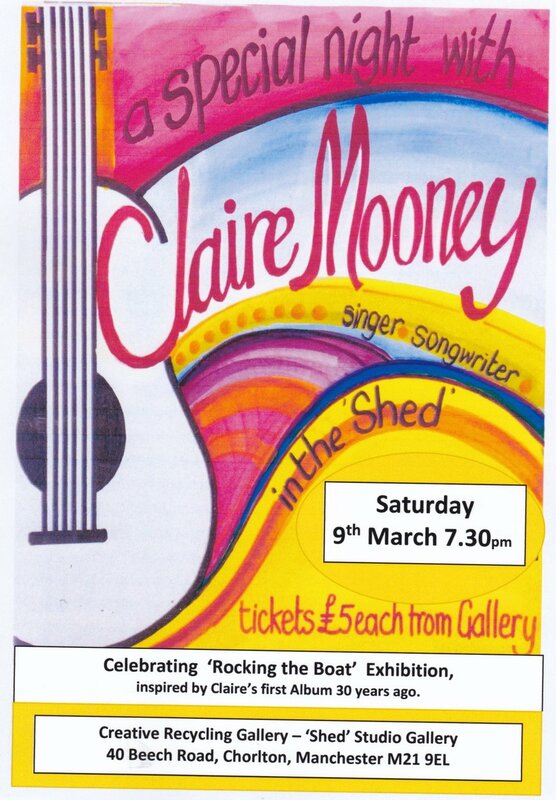 An Evening with Claire Mooney - Songwriter and Poet. limited seating - best to reserve in advance. An Exhibition exploring where we are now, and where and how we may arrive....... a comment on recent contemporary events that are directing our lives in Britain today. We welcome you to browse beautiful seasonal displays of Art and Craft, and Gifts for all, whilst enjoying at Glass of Mulled Wine, and Homemade Dundee Cake......... and meet the Artists. Join us on Beech Road, in Chorlton (M21 9EL) for a great seasonal experience. Arts and Crafts include: Sculptures in Stone, Wood and Metal, Ceramics, Clocks, Accessories, Jewellery, Upcycled Novelties, and Christmas Cards. A wide range of products and variety of styles, all made to the highest quality. Gift Tokens also available. We will be fundraising for those who care for the Homeless in Manchester. Gwyn is a well establish artist living in Manchester. She has a body of work from Illustration (Book Covers eg. Agatha Christie, Maeve Binchy, Laurie Lee) to figurative, and portraiture. Her work is inspiration. This Exhibition is an opportunity to view/buy a small new pieces, as well as see some of the work she has produced over the years. For many who know her, and have followed her work, it is a great treat to welcome her to our Gallery. Franka Mente is an Italian Illustrator, from Naples, studying in Rome, now living in Manchester. 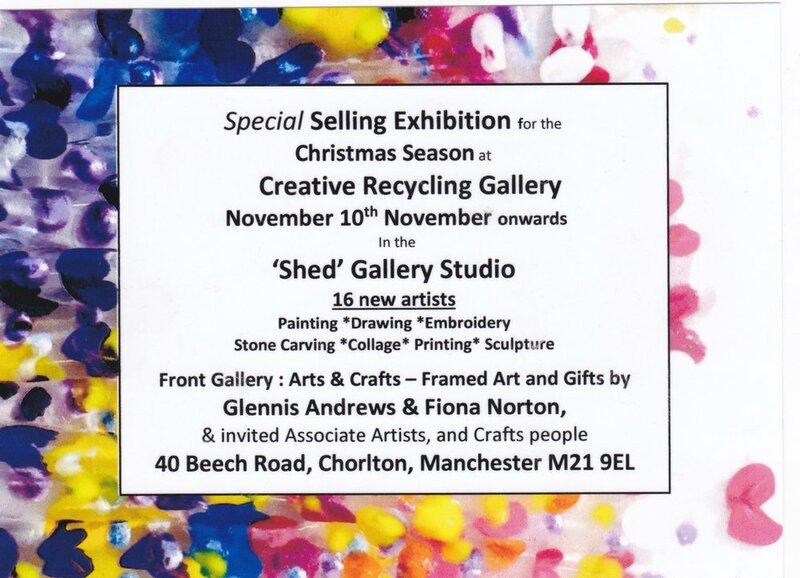 Creative Recycling Gallery are promoting her as part of our 'Emerging Artists Programme" in the 'Shed' Gallery to the rear of the Main Gallery, situated in the Garden Gallery space. A range of ~`Pictures and Wall Hangings, by this Aware Winning Artist. A great set of new work - a study of beautiful birds. This Display will be followed next month by a different range of studies of nature. Carla Foulds is a talented painter, and we are featuring her as one of the emerging artists we are promoting for 2016.